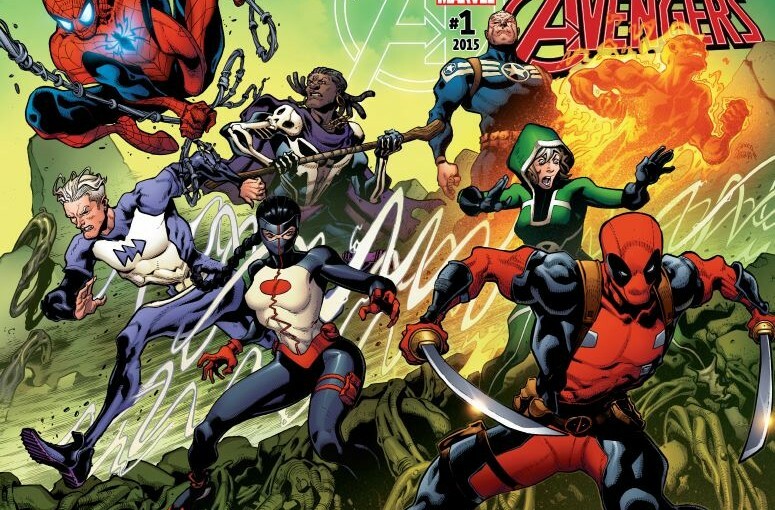 The Uncanny Avengers (2015) #1 takes place after the Avengers vs X-Men, when Captain America decided to formed a team featuring mutants and humans called Avengers Unity Division, this team of Captain Steve Rogers, Rogue, Deadpool (Wade Wilson), Human Torch (Johnny Storm) Synapse (Emily) (First appearance), Doctor Voodoo (Jericho Drumm), Quicksilver (Pietro Maximoff),Spider-Man (Peter Parker) are supposed to show the world that all of mankind can work and live together in peace, with that said coming into this I wasn’t familiar with its first run by Rick Remener so I had no unbiased opinions before reading. One of the few things I found to be head scratching is the implementing of the inhumans into the story, granted this run takes place months after the original teams run post-Secret Wars, Rogers and company are still trying to improve human and mutant relations while also keeping a terrigen mist outbreak from turning the world upside down once again, but the main focus in this issue is the team’s dysfunctional unity. Throughout the entirety of this issue Cap has to deal with jealousy, anger and resentment within the group. 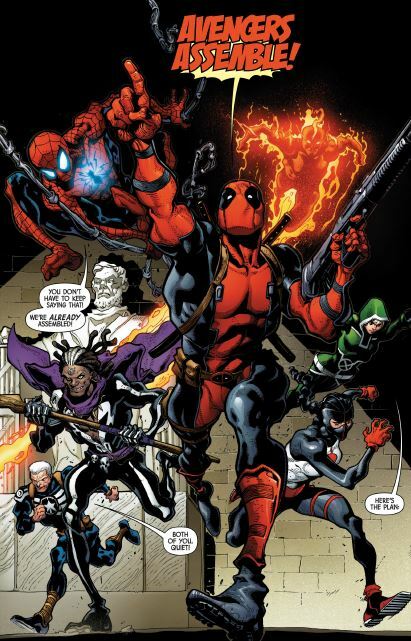 One of the groups key member Spider – Man quits because of his dislike for Deadpool, stating that he is a distraction and too dangerous for the team, on the other hand rouge also expresses her discomfort with Deadpool also, she admits she’s tired of him and all the limelight he’s been receiving, but Cap tells her that Deadpool’s popularity is bring in funds for the team so she as well as the others have to deal with him for now, For me the most intriguing moment of the issue is when Rouge expresses her true feelings towards the inhuman outbreak, calling it inhuman poison she goes on to tell Cap she doesn’t truly trust Synapse because of her inexperience, we also get a glimpse of Terrigen Mist’s effects on Rouge after takes off her glove when she checks her Terrrigen levels. With all this drama surrounding this team so early it’s hard to believe that members won’t be replaced, things do get a little better when an outbreak of spores that evolving into insects and animals attack New York City during Quick Sliver and Synapse’s date, this makes the team come together as they try to figure out who is behind the attack. The issue ends when a cop who is evacuating people stumbles upon a new villain by the name of Shredded Man. Conclusion: Besides the group’s inner turmoil nothing real catches your attention, in fact this seemed more like a 3rd or 4th issue, the lack of appealing members of the team is big downside for me, tag that with a poor plot development make this issue uninteresting for the time being, hopefully in the future that will change.